There have been lots of good reviews on Goodreads now for both The Kult and Deadfall, but a number of people still point out that The Kult has spelling and grammatical errors. Now I know what the selling errors are, but the grammatical errors still leave me stumped as I can't spot them - but then I guess if I or the editors had spotted them, they would have been corrected. It's embarrassing, but I hope it doesn't spoil anyone's enjoyment too much. Now anyone who’s followed me for a while knows that I have a manuscript called Fangtooth that I’ve had accepted for publication twice, and both times I’ve withdrawn it for one reason or another. Well I’m pleased to report that it’s been accepted for publication again, this time with the publisher of The Kult and Deadfall. Yes, I’ve just signed a contract with Leucrota Press for it. Hopefully it’s third time lucky. When I get the green light, I’ll post a picture of the cover. The tag line: There’s something in the sea. Something ravenous. As for the film, a post has been made in The Kult film update about props. I hadn’t really thought about them before, but the article makes me realise how important they are, right down to a tiny thing like a pill bottle! Please feel free to check it out and let me know what you think: http://gharialproductions.com/projects/the-kult/the-filmmaking-process-props/ I’m planning on flying out to see some of the shoot, so I’m just waiting on a schedule so that I can make arrangements. Really looking forwards to it. by Guillermo Del Toro. Highlights so far in the Zombie antho have been Tim Lebbon’s ‘In the Dust’ and Jonathan Maberry’s ‘Family Business’. Lebbon has crafted a poignant story that pulls at the heartstrings, and Maberry has crafted a hauntingly realistic world in the zombie aftermath. The Strain has its moments, but I’m finding the factual interludes distracting as they drag me out of the plot, but it’s well written and engaging when it concentrates on the story. Back in 2000, a new attraction called Hex was unveiled at the popular UK theme park, Alton Towers, which resides in the sleepy heart of Staffordshire. Apart from the ancient castle in the middle of the grounds, Alton Towers seems like any other amusement park with its sinisterly named white knuckle rides like Nemesis and Oblivion. But the Hex attraction stands apart, as it’s based on a true legend. “On an autumn night in 1821, the Earl of Shrewsbury was returning to his home in Alton Towers when an old woman suddenly appeared in the road. The coach stopped to find out why she was there, at which point the old woman begged for a coin. The Earl cruelly dismissed her, so the old woman placed a curse on him: 'For every branch on the Old Oak Tree here that falls, a member of your family will die.' The Earl dismissed the old woman and carried on his way. Now although I had been on the Hex ride a couple of times, like most people, I presumed the legend was ‘made up’ for the benefit of the attraction. 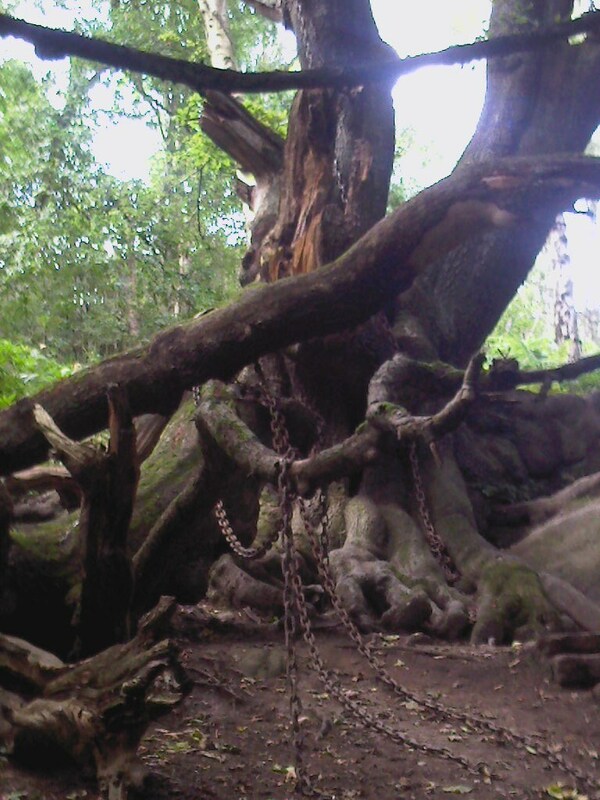 But then I discovered that the chained oak supposedly really existed in a wood outside the park, and that as a result, the legend had a basis in fact, not fiction. Intrigued, I wanted to ascertain the chained oak’s validity for myself, and so with my family in tow, I set out to find it. According to articles I found on the internet, the oak tree could be found a mile or so away from the theme park, in a place called Dimmingsdale wood. Despite the use of satellite navigation, I still had trouble locating the wood, which didn’t bode well for finding a single tree, but eventually, after navigating a narrow lane only just about wide enough for the car, we arrived at a parking spot from which to begin our search. With the help of a little advanced internet research and a modern day global positioning satellite system, we exited the car park on foot and proceeded into the trees. After a couple of false starts, we crossed a bridge over the river, and made a steady uphill climb through the green mantle. But as the trees crowded closer, the foliage overhead played havoc with the GPS and I kept losing the signal – at least I told myself it was only a result of the foliage, as I recalled reading online posts from other people that had set out to find the chained oak, only to have been waylaid by misfortune, from simple things such as their cameras not working when they wanted to photograph the tree, to people falling and injuring themselves, or being involved in car crashes after leaving the site. With the GPS now out of commission, we proceeded up the path, in the direction that the device had indicated before it gave up the ghost. As we climbed, I became aware of a distant rumbling that reverberated through the ground, followed by bloodcurdling screams that gave me pause for thought. It took a moment to realise it was just the adrenaline fuelled cries of the brave souls riding the rollercoaster’s in the theme park somewhere in the distance, and not some distant echo of past tragedies. As we continued, I spotted a set of stone steps set into the bank up ahead, trailing beside which were rusted chains. Heart pounding, I looked up and there it was, the chained oak. From the number of branches that had fallen from the tree, if the curse is real, the Earl’s family must now be decimated, but it is still an awe-inspiring sight to behold. One large branch lay beside the steps. It broke off in 2007, and the present Earl of Shrewsbury, Charles Chetwynd-Talbot was happy to report at the time that no member of his family died as a result. Chains had been assimilated by the wood that had grown around it, revealing that the chains must have been in situ for a considerable time. And they certainly weren’t dainty little chains either, but big, clunking rings of metal as big as my fist that had rusted over the years. The boughs creaked in the slight wind, creating an almost unearthly timbre, and dappled sunlight cast lurid shadows, adding to the ambience of the place, a place where fact and fiction intertwined like the branches overhead. Standing in quiet contemplation, I tried to imagine the people that had climbed the tree to attach the chains. Some people say the tree was chained for nothing more sinister than a hoax. Others say that the chains were used to pull things up the bank. Yet others say they were used for some form of witchcraft ritual. Whatever the reason, someone had taken the considerable time and effort to attach them. But it is certainly easy to imagine that they were attached upon the Earl’s orders. After all, the eighteenth century was still an age of superstition and among the populace, the belief in witchcraft and a hundred other superstitions still flourished, so being cursed would certainly encourage someone to do whatever they could to stop it coming true. Another story behind the chained oak is no less intriguing, and states that at the opening ball in the Banqueting Hall, the 15th Earl of Shrewsbury hosted nobility and royalty. Into their midst came an old man, hoping to earn a night's keep by telling their fortunes. Mocked and ejected by the company, he turned to the host and said: "Every time a branch falls from the giant oak by your entrance, so will a member of your family fall and die". The next day, the Earl had all its branches chained. A third version goes that the Earl's son was out riding the next day and as he passed the old oak tree the woman had been standing under, a branch fell on top of him, knocking him from his horse and killing him. This story is slightly more plausible, as there are records of a riding accident around that time. Another piece of the puzzle that adds a touch of authenticity to the tale is that in 1807, a coach road was cut through the wooded dell, and it used to be the main thoroughfare to Alton Towers, and it is on this road that the chained oak stands, and so would have been used by the Earl in 1821. The road is now reported to be haunted by a headless horseman (that of the felled rider? ), which is easy to imagine as you stand beneath the creaking branches. There is certainly an eerie atmosphere surrounding the area, and whatever the reality behind the chained oak, as we left, I couldn’t help thinking about the screams ringing in my ears. Whatever their origin, they couldn’t be more fitting, and I’m sure that as with many things, at the heart of the mighty oak there might yet lie another story, a story far more sinister than the fiction. And finally, a third casting call for minor characters for The Kult film will be held on June 26th at 9 am. 41133 Raintree Court, Murrieta, Ca 92562.